Job Postings - Visit our page for current urban forestry jobs available. 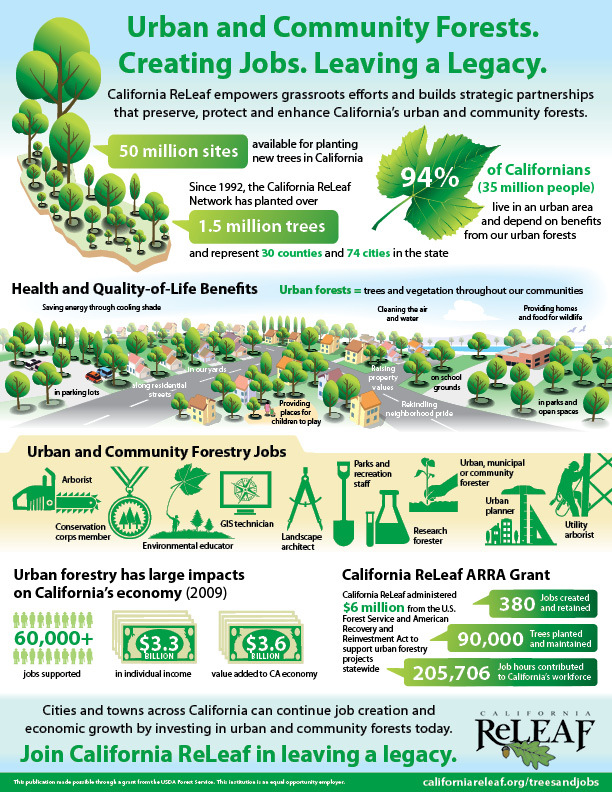 California ReLeaf is happy to support the sharing of best practices, knowledge, and personnel resources amongst the urban forestry community. If you have an opening you’d like us to share with our network, please contact info@californiareleaf.org. West Coast Arborists, a union company and industry leader in tree maintenance, is hiring entry-level & experienced Ground Workers and Tree Trimmers/Climbers to assist the tree operations in clearing brush, planting trees, watering trees, driving equipment, quality customer service and basic traffic control functions as directed by the crew Foreman. Positions are located throughout California and Arizona Orange County, Los Angeles County, Riverside/Inland Empire, Palm Desert/Palm Springs, Santa Clarita, Ventura, San Diego, San Jose, Sacramento, Mesa/Tempe, Arizona. The Community Forestry Associate is the first point of contact for the Sacramento Tree Foundation and the Sacramento Shade program. The Community Forestry Associate works to provide informational and courteous communication with the public and promotes Tree Foundation programs by phone, email and in-person. This position works closely with the other members of the Education Department, scheduling Sacramento Shade site-visits and responding to general questions. This is a role for individuals that are task oriented and want to play an important role within a complex team. The City of Los Angeles (City) is seeking a dynamic and expert leader to become the City’s first City Forest Officer (Forest Officer). 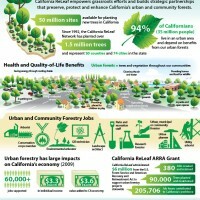 Los Angeles is home to the nation’s largest urban forest and largest urban park, is comprised of diverse watersheds, and is a unique biodiversity hotspot. Despite the foundational challenge of an inequitably distributed tree canopy and more recent stressors such as drought and pests, the City is making headway to regenerate, expand, and revitalize the state of our urban forest and the Forest Officer will be critical to the City’s success. This person manages the Urban and Community Forestry Program by planning and implementing all phases of the program, including policy development, budget development, and management, strategic planning and interpretation of laws, rules, and regulations. S(he) serves in a program leadership role for the Region and is the liaison with regional state program managers, including processing grants and agreements and pass-through funds. Initiates develop and manage urban forestry policy and suitable forms of technical or educational assistance available to state and private organizations. Serves as a recognized authority in forest management practices and policies as they relate to community development needs. Coordinates with other federal, state and private agencies and organizations on wildland management and enhancement opportunities on forest lands. This person the recognized expert in coordinating and implementing all aspects of the Forest Legacy program, as well as other forest land or interests in land acquisition programs for the Eastern Region, State & Private Forestry. S(he) provides advice and assistance in the development and implementation of State Forest Legacy and other land or interest in land acquisition programs to parties such as State Foresters and their staff, State Stewardship Committees, land trusts, and other groups. Using expert knowledge of natural resources management and forest management interprets federal laws and State programs to develop program policies, reviews State prepared documentation prior to submittal to the Department of Agriculture for approval. Canopy is seeking a hard working, dedicated person to join our team and grow with us as we aim to accomplish our vision. The ideal candidate will have experience in either community organizing or urban forestry, and will develop a passion for both over time. The work week will likely be Tuesday through Saturday with early mornings and evenings on occasion. The Society of Muncipal Arborists is seeking both 10-Week Summer Internships for 2017 (where students will experience the full range of job duties of the municipal arborist/urban forester) as well as Project-Based Internships (where students will work on specific projects — including but not limited to tree inventories, tree planting, PR/marketing campaigns, iTree analyses, research, and more) in various host cities. Click here to view the full posting.